These days there is a lot of talk on TV and in dog raising books about dominance in the relationship between dogs and humans. While this topic can make for dramatic television material, it is very rare that a dog is trying to dominate his person or household. The true definition of dominance as it applies to canine relationships refers to who gets access to what resources. Decide on a set of rules for what is and is not ok for your dog in your home. For instance, is your dog allowed on the furniture? A good way to decide on rules is to imagine an evening at home and how you would like to share that time with your dog. Also, imagine an evening when you have company because you need rules that are consistent whether company is over or not. If there are multiple people who share your home make sure that everyone is familiar with the rules for the dog. Make a list of everything that your dog considers a resource, i.e., anything they want from you. For instance all dogs need us for their food, access to the outdoors, to throw their toys, etc. Once you have that list make sure that you ask your dog to do something for you such as “sit” before you give them anything from that list. Teach your dog to lie down and stay. We cover this behavior in our training classes and it is key to your dog learning self-control and how to settle. Make a schedule and keep it loosely. This means that your dog knows that you will provide daily exercise, training, meals, potty breaks, and downtime, but not necessarily at the same time every day. In this way your dog feels secure that all of his needs are met, but does not become neurotic if the timing changes. Control your temper. All dogs push our buttons sometimes. Maybe you came home to a chewed up shoe or your dog jumped up and got mud all over your favorite outfit. No matter what, our dogs are instinctive animals who act without malice or design. 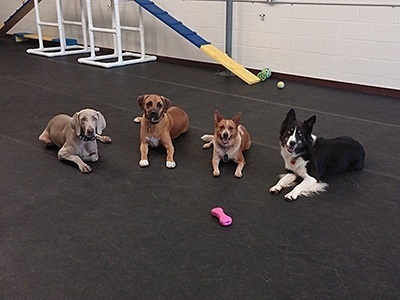 Therefore, if you feel mad at or frustrated with your dog give yourself and your dog a breather in separate spaces and call us at Perfect Pet Dog Training, LLC for advice on how to prevent the problem behavior from occurring again.